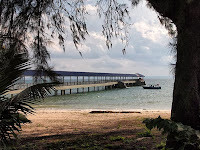 Although ‘going to the island’ sounds like a line from a well-known film, for us it means getting away for a few days on our favourite Malaysian island of Pulau Besar. October is almost the end of the tourist season on the islands off Mersing as the monsoon generally sets in at the beginning of November. Nonetheless, we booked two sea-view cabins; one for ourselves and another for our Flossie and her boyfriend Duncan who arrived a few days ago. The car knows where it’s going by now. As mother used to make the most delicious sandwiches for the family on our travels around Oman, we had only reached as far as Malaysian immigration before Floss asked for her chicken, avocado and mayonnaise roll. Sadly we had to disappoint. Two-and-a-half hours later, we arrived at Mersing jetty and whizzed over a relatively calm sea to the island. The rickety wooden jetty on Pulau Besar has been replaced by a smart new concrete construction of standard Malaysian jetty design. One of the staff said, ‘Welcome home’ as we checked in to the Aseania Beach Resort. They were right - it does feel like home. It didn’t take long to realise that they were still filming on the island. 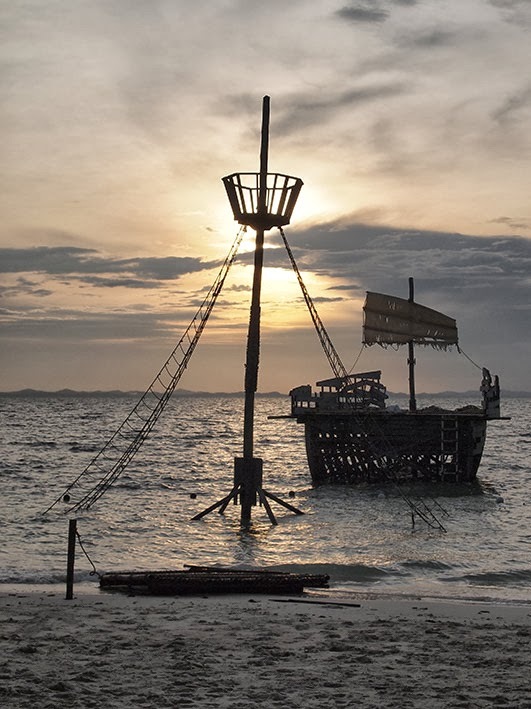 The South African ‘Survivor’ crew were gathered in small groups around the dining area while trolleys containing bits of equipment, props and shrubberies trundled in the direction of the sets further up the beach. After lunch, I strolled along the beach path which had signs to clearings in the jungle towards the various sets; there was even a shipwreck set in the sea with large catapults for projecting coconuts towards wooden targets. I spoke to one of the crew who said the contestants have to live in the jungle and even have to find their own food (on a holiday island?). All I could think was, ‘What have they done to my island?’ The rest of the family did not care as they made the most of the toasty sunshine on the beach.